Inspiration usually hits me like a brick. One minute I want for nothing and the next all I can think about is a long sleeve, grey, knit dress. My first thought was to make it from scratch. I already had a personal pattern for a sleeveless, fitted knit dress. I just drafted sleeves and extended the sleeve arms and the (ever so slightly tapered) bottom hem to the length I wanted. You could easily modify any closely fitted T-shirt pattern to make a dress like this. I was going to look up some patterns for you, but Creative Chick has already done the research and I see no point in re-inventing the wheel. Check out her very comprehensive summary list of top patterns, with a quick description of each. For a dress like this, you will need a close fitting T and very stretchy jersey. A wide variety of necklines would suit it. Once you have a T-shirt pattern that fits perfectly, simply extend the arms in a tapered fashion to the length you want. I’m fond of ultra long arms right now so I extended mine beyond the wrist. Use your fitted T-shirt as a guide when extending your pattern pieces. 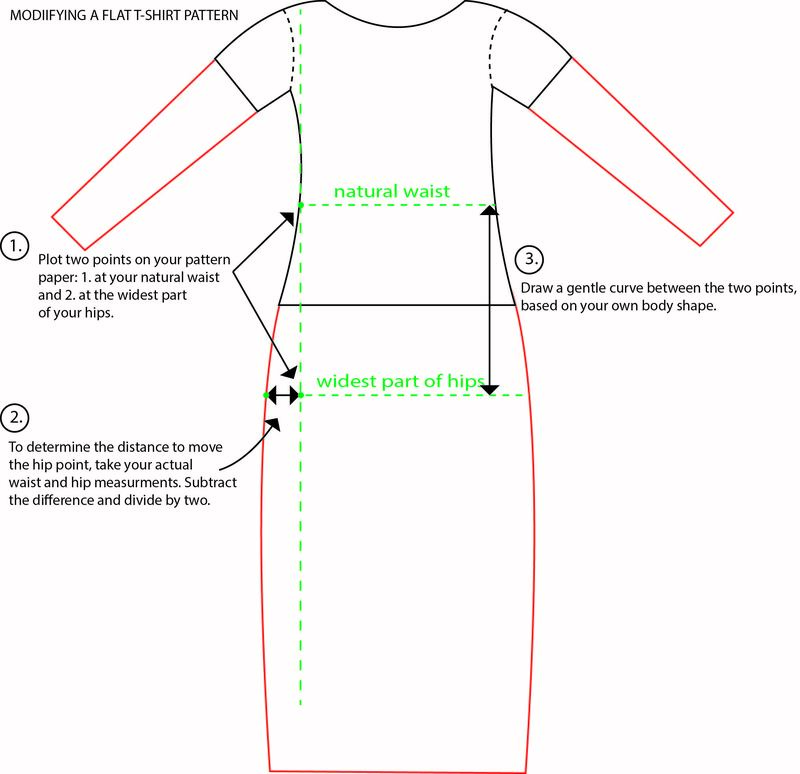 The diagram shows my extended dress outline in red and my measurement guide in green and black. My fabric had a lot of stretch, so I didn’t need to add any darts for shape. I simply narrowed the waist to avoid too many lower back wrinkles. Stable knits will need bust darts and back darts for a fitted look. I used a lofty, stretchy, wool/acrylic blend, sweater knit for my first version. I’m sceptical of how long the fabric will last, but right now, I’m totally in love with it. In fact, I liked the dress so much that I immediately made a second. My second version is a little more interesting. It’s a truly awesome pure wool ponte knit from Tessuti Fabrics. I’m labelling it truly awesome because it is warm, thick, has great recovery in a stable, ponte-style stretch, has been machine washed more times than I can remember, and just between you and me, I often throw it in the dryer in winter so I can wear it more frequently. It’s possible that the fabric may have faded a bit, but not that I can tell (it’s grey after all), but there is no pilling, no thinning, no stretching, no shrinking, and no other major signs of wear. It cost me a pretty penny but it has been worth every cent. There’s also a story behind this fabric. In a fit of panic at the idea of landing in Kansas during the infamous polar vortex of two years ago, I purchased several metres of it before I left Australia. I used it to make myself two winter dresses. One was a drop waist Malvarosa and although the loose fitted style had me on the fence, I ended up wearing that (pyjama) dress almost daily for two consecutive winters. I also made myself a fit and flare dress (modified significantly from V8805) and a few other winter items for my girls. The contrast skirt on this second dress didn’t fare as well as the grey ponte knit so I cut it off last year and turned the dress into a simple long sleeve top. I don’t have photos of the top because it was just a wardrobe staple and not blog worthy at all. When I made the top last year, I removed the (nursing friendly zipper) from the original dress and simply joined the front seam. I also finished the neckline and sleeves with black cotton ribbing. The top was functional, but probably not the most glamorous item in my wardrobe. I didn’t particularly like the neckline. It was just a bit wide for my taste. So for this knit dress, I wanted to see what I could do to fix it. Simply unpicking the original (serged) neckline would have been arduous and wouldn’t have fixed the size and width problem. My solution was to draft a (slightly) stand up collar, that I then attached directly to the existing binding using a small seam allowance. The effect is a contrast line of ribbing between the collar and dress which I absolutely love. This second knit dress was made completely on the fly. The sleeves are possibly a smidgen too long (I got carried away with my length obsession) and there was a lot of (bulky) seaming involved in achieving the length I wanted. Because I was dealing with a more stable knit fabric, I kept the original bust darts and added two fish eye darts to the back for shaping. I love how my two versions turned out. Here are a few more RTW examples for your inspiration. This entry was posted in dress, fabric, jersey, knit, maxi, Mood Fabrics, refashioning, Tessuti Fabrics, upcycling, wool and tagged dress, grey, jersey, knit, knit dress, maxi, maxi dress, Mood fabrics, ponte, refashioning, sweater knit, Tessuti Fabrics, wool on October 9, 2015 by Debbie Iles. Oh so chic Debbie – I do love a fitted knit dress – my fave pattern for me has been the Maria Denmark Audrey dress with those back darts. And wool ponte – a fabric holy grail! Great reuse and up cycling and that collar is gorgeous! Looks great and thanks so much for the tips. Inspiration tends to hit me like a brick too. 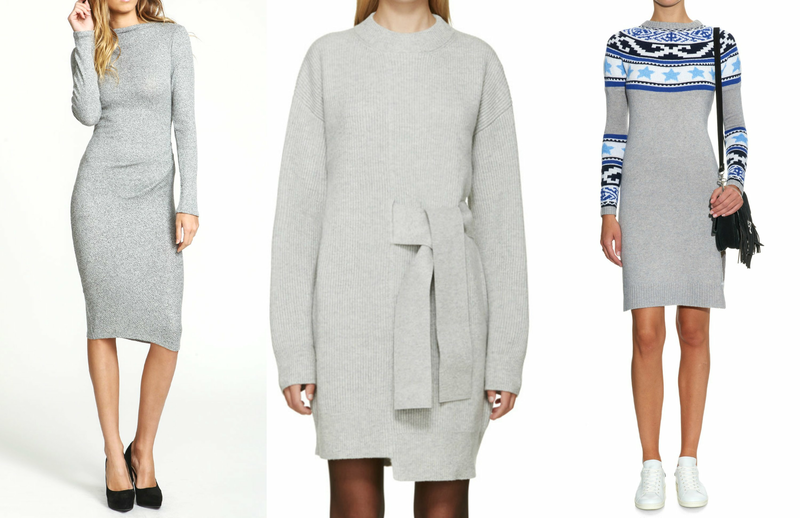 Yesterday I saw a girl in a shop wearing a grey knit dress much like yours and I knew I had to make one. This post is very timely! Okay, you look like a Bond girl in that first photo. Wow. I love the design so much, especially those brilliant super-long sleeves and stand-up collar. And I love the length of these dresses too – especially for cooler/cold weather. Also, I laughed at your comment that inspiration hit you like a brick. Yeah, that’s the best!